3-Lillias May Dobson was born on 27 Dec 1879 in Exton, Tasmania and died on 24 Jun 1952 in Ulverstone, Tasmania at age 72. Lillias married Alexander Smith, son of Robert Smith and Catherine Mather, on 2 Aug 1898 in Emu Bay, now Burnie, Tasmania. Alexander was born on 13 Apr 1873 in Port Sorell and died on 28 Jun 1959 at age 86. 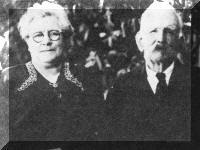 Lillias May Dobson married Alex Smith on the 2nd August, 1898 at Burwood, and they settled in the district. However, the farm was not profitable and Alex went to work for Mr. Joe Midgely at "Burwood", Pineroad, but the situation was not successful according to their daughter the late Win Sushames. Win also remembered attending a private school run by old Mrs. Counsel at 'The Gables", along with her sister Ruth (Oliver) and brothers Harry and Arch. The family moved to the Stonehouse property, and from there, Win started school at Riana, where Mr. Oliver was the Headmaster. His son Alec, was to later marry Win's sister Ruth. The Smith family moved again to work for wages at Mr. and Mrs. Langham's farm and then after two years another move was made to south Riana where Alex worked at Pilbeams sawmill for a time before a further move to Flowerdale and then to Smithton. They finally retired to Ulverstone after working on many farms along the North West Coast. Lillias passed away on the 24th June, 1952 and Alex died on 28th June, 1959 after being cared for by his daughter Win. 4-Ruth May Smith was born on 1 Aug 1899 in Ulverstone, Tasmania and died on 30 Jun 1959 at age 59. Ruth married Alexander Oliver, son of Alexander Oliver and Miriam Groom, on 1 Jul 1920 in Penguin. Alexander was born on 3 Mar 1897 in Ulverstone, Tasmania and died on 18 Jul 1980 at age 83. Her served in the First World War. They had eight children: Laurence, Donald, Ken, Stewart, Bruce, John, Robert and Dale. 5-Laurence Oliver was born on 23 Oct 1921 and died on 26 May 1971 at age 49. Laurence married Nancy Revell. Nancy was born on 15 May 1925. They had six children: Gerald, Patricia, Anne, Graham, Stephen and Janice. 6-Gerald Oliver was born on 14 Sep 1947. 6-Patricia Oliver was born on 14 Nov 1949. Patricia married Peter Jarvis. Peter was born on 26 Sep 1949. They had three children: Allison, Mark and Sharon. 7-Allison Jarvis was born on 9 Oct 1973. 7-Mark Jarvis was born on 5 Oct 1976. 7-Sharon Jarvis was born on 9 Apr 1979. 6-Anne Oliver was born on 17 Jan 1955. Anne married Andrew Swanson. Andrew was born on 4 Apr 1955. 6-Graham Oliver was born on 15 Aug 1956. 6-Stephen Oliver was born on 22 Mar 1959. 6-Janice Oliver was born on 12 Oct 1963. 5-Donald Oliver was born on 2 Dec 1922. Donald married Phyllis Jean Blair. Phyllis was born on 13 Dec 1921. They had six children: Valma, Wayne, Sandra, Maxine, Tina and Trudie. 6-Valma Oliver was born on 10 May 1942. Valma married Laurie Howard. Laurie was born on 14 Sep 1939. They had two children: Michele and Dean. 7-Michele Howard was born on 30 Jan 1960. 7-Dean Howard was born on 9 Mar 1961. Valma next married Michael Sweeney. Michael was born on 24 Jun 1953. 6-Wayne Oliver was born on 21 May 1945. Wayne married Sue Dart. Sue was born on 6 Nov 1946. They had one son: Jamie. 7-Jamie Oliver was born on 16 Mar 1969. 6-Sandra Oliver was born on 27 Apr 1947. Sandra married Brian Devlin. Brian was born on 2 Jan 1945. They had two children: Scott and Sheree. 7-Scott Devlin was born on 24 Mar 1965. 7-Sheree Devlin was born on 30 Jun 1966. 6-Maxine Oliver was born on 2 Jul 1954. Maxine married Maurice Jones. Maurice was born on 9 Jan 1949. They had two children: Kurt and Calum. 7-Kurt Jones was born on 29 Oct 1971. 7-Calum Jones was born on 19 Nov 1979. 6-Tina Oliver was born on 20 Oct 1958. 6-Trudie Oliver was born on 29 Mar 1960. Trudie married Daniel Heineke. Daniel was born on 2 May 1958. They had one daughter: Elissa Christan. 7-Elissa Christan Heineke was born on 12 Nov 1987. 5-Ken Oliver was born on 28 Jul 1924. Ken married Lynn Brett. Lynn was born on 24 Jun 1926. They had one daughter: Vickie. 6-Vickie Oliver was born on 19 Feb 1949. Vickie married Theodore Petrus. Theodore was born on 31 Aug 1945. They had two children: Justin Brett and Kristopher Peter. 7-Justin Brett Petrus was born on 14 Jul 1977. 7-Kristopher Peter Petrus was born on 10 Sep 1979. 5-Stewart Oliver was born on 11 Nov 1928. Stewart married Pauline Jackson. Pauline was born on 18 May 1937. They had three children: Gregory, Garry and Tony. 6-Gregory Oliver was born on 20 Jun 1956. 6-Garry Oliver was born on 17 Dec 1957. Garry married Beverley Joan White. Beverley was born on 31 Mar 1960. 6-Tony Oliver was born on 11 Nov 1959. 5-Bruce Oliver was born on 4 May 1932. Bruce married Judy McCallum. Judy was born on 27 May 1934. They had three children: Gaylene, Christine and Michael. 6-Gaylene Oliver was born on 21 Oct 1957. Gaylene married Jeff Melhuish. Jeff was born on 9 Jan 1955. They had two children: Stacy and Brent. 7-Stacy Melhuish was born on 5 May 1976. 7-Brent Melhuish was born on 24 Jul 1978. 6-Christine Oliver was born on 21 Feb 1959. 6-Michael Oliver was born on 10 Aug 1963. 5-John Oliver was born on 4 Jul 1935. John married Merleen Ruby. Merleen was born on 12 May 1941. They had three children: Peter, Mark and Colin. 6-Peter Oliver was born on 23 Jun 1962. 6-Mark Oliver was born on 17 Sep 1964. 6-Colin Oliver was born on 11 May 1970. John next married Merleen Ruby. Merleen was born on 12 May 1941. They had three children: Peter, Mark and Colin. 5-Robert Oliver was born on 17 Mar 1937. Robert married Janice Wooley. 5-Dale Oliver was born on 13 Oct 1942. Dale married Sandra Briggs. Sandra was born about 1944. They had four children: Narelle Louise, Elizabeth May, Stewart Damien and Craig Dale. 6-Narelle Louise Oliver was born on 24 Jun 1962. 6-Elizabeth May Oliver was born on 29 Sep 1965. Elizabeth married someone. She had one son: Brodie. 7-Brodie Oliver was born on 25 Apr 1987. 6-Stewart Damien Oliver was born on 29 Apr 1969. 6-Craig Dale Oliver was born on 25 Mar 1970 and died on 28 Oct 1987 at age 17. 4-Henry Robert Smith was born on 31 Aug 1900 in Pine Road, near Penguin and died on 6 Jun 1985 at age 84. Henry married Frances Irene Rundle, daughter of Arthur Osborne Rundle and Elizabeth Annie Marsden, on 11 Aug 1926 in Home of Brides parents, Eugenana, Tasmania. Frances was born on 17 May 1905 in Melrose, Cressy and died on 1 Sep 1986 at age 81. They had two children: Ivy and Arthur. 5-Ivy Smith was born on 27 Aug 1927. Ivy married Eric Terry. Eric was born on 5 Jun 1910. They had two children: Gregory and Alan. 6-Gregory Terry was born on 22 Aug 1947. 6-Alan Terry was born on 17 Nov 1950. Alan married Beryl Gercouich. Beryl was born on 19 May 1949. They had three children: Wayne, Troy and Tracey. 7-Wayne Terry was born on 27 Dec 1973. 7-Troy Terry was born on 25 Dec 1975. 7-Tracey Terry was born on 20 Aug 1980. 5-Arthur Smith was born on 26 Sep 1929. Arthur married Miriam Streets. Miriam was born on 11 Nov 1930. They had two children: Adeline Frances and Irene Maude. 6-Adeline Frances Smith was born on 6 Dec 1953. Adeline married Lloyd Cox. Lloyd was born about 1951. They had two children: Nicholas Lloyd and Rachel Margaret. 7-Nicholas Lloyd Cox was born on 21 Mar 1976. 7-Rachel Margaret Cox was born on 20 Jun 1978. 6-Irene Maude Smith was born on 17 May 1956. Irene married Neil Quinn. Neil was born on 17 Jul 1955. They had three children: Damien Michael, Kristie Lee and Lisa Ann. 7-Damien Michael Quinn was born on 31 Aug 1978. 7-Kristie Lee Quinn was born on 22 Jan 1981. 7-Lisa Ann Quinn was born on 21 Jun 1983. 4-Archibald Norman Smith was born on 12 Sep 1903 in Pine Road, near Penguin and died on 21 Jul 1981 at age 77. Archibald married Ruby May Barker, daughter of John Jacob Robert Barker and Lucy Anne Fielding, on 16 Oct 1929 in South Riana. Ruby was born on 16 Oct 1909 in Riana. They had six children: Larry, William, Lucy Gwen, Geoffrey, Ronald and Bruce. 5-Larry Smith was born on 20 Jul 1930 and died in 1943 at age 13. 5-William Smith was born on 3 Nov 1932. William married Dawn R. Reid. Dawn was born on 28 Feb 1937. They had two children: Sheryl and Shane Robert John. 6-Sheryl Smith was born on 21 Jul 1959. Sheryl married Llane Dixon. Llane was born on 3 Dec 1962. They had two children: Kurt and Aaron. 7-Kurt Dixon was born on 26 Aug 1980. 7-Aaron Dixon was born on 25 Sep 1982. Sheryl next married Leslie Philip Templar, son of Maxwell Philip Templar and Betty Anne Good. Leslie was born on 24 Sep 1955. They had two children: Dwayne and Leslie. 7-Dwayne Templar was born on 26 Apr 1982. 7-Leslie Templar was born on 30 Oct 1983. 6-Shane Robert John Smith was born on 30 Jul 1960. Shane married Llani Lee Dixon. Llani was born on 3 Dec 1962. They had two children: Kurt and Aaron. 7-Kurt Smith was born on 26 Aug 1980. 7-Aaron Smith was born on 25 Sep 1982. 5-Lucy Gwen Smith was born on 1 Apr 1934 and died on 25 Nov 1986 at age 52. Lucy married Earnest Reginald Templar. Earnest was born on 19 Jul 1933. They had three children: Debra, Christopher and Grant. 6-Debra Templar was born on 19 Feb 1957. 6-Christopher Templar was born on 19 Dec 1958. Christopher married Faye Hide. Faye was born on 16 Oct 1958. 6-Grant Templar was born on 1 May 1961. 5-Geoffrey Smith was born on 21 Oct 1935. Geoffrey married Betty Butler. Betty was born on 18 Nov 1934. They had four children: Juleen, Michael, Mandy and Donna. 6-Juleen Smith was born on 24 May 1960. Juleen married Gerald Crane. Gerald was born in 1959. They had one son: Mathew. 7-Mathew Crane was born on 4 Aug 1980. 6-Michael Smith was born on 18 Aug 1963. 6-Mandy Smith was born on 9 Aug 1966. 6-Donna Smith was born on 1 Nov 1968. 5-Ronald Smith was born on 6 Mar 1941. Ronald married Noleen Radford. Noleen was born about 1942. 5-Bruce Smith was born on 7 Mar 1945. Bruce married Annette Kay. Annette was born on 2 Mar 1947. They had four children: Craig, Michelle, Stephen and Tania. 6-Craig Smith was born on 10 Aug 1963. 6-Michelle Smith was born on 17 Jul 1965. Michelle married Wayne De Bomford. Wayne was born on 29 Sep 1963. They had one daughter: Sarah Ann. 7-Sarah Ann De Bomford was born on 15 Oct 1985. 6-Stephen Smith was born on 7 Apr 1966. 6-Tania Smith was born on 9 Oct 1970. Tania married Craig Peter Lucas. Craig was born on 27 Mar 1963. They had two children: Kristy and Emma. 7-Kristy Lucas was born on 31 Jul 1995. 7-Emma Lucas was born on 29 Aug 1996. 4-Winifred Ivy Smith was born on 6 Jun 1905 in Pine Road, near Penguin and died on 31 Oct 1985 at age 80. Winifred married Arthur Lewis Coates, son of George Coates and Martha Perry, on 10 Jun 1925 in Broadmeadows. Arthur was born on 5 Mar 1899 in Mersey, Devonport and died on 21 Apr 1940 at age 41. They had seven children: Hazel May, Percy Stephen, Neil, Basil Arthur, Aileen Mona, Leslie and Marion Jessie. 5-Hazel May Coates was born on 14 Feb 1926 and died on 14 Nov 1973 at age 47. Hazel married William Andrew Appleby, son of William Robert Appleby and Theresa Phyllis Bishop. William was born on 6 Jul 1920. They had four children: Allan Arthur, Colleen Phyllis, Beverley Mavis and Shirley Vonda. 6-Allan Arthur Appleby was born on 14 Nov 1945. Allan married Carol Maree French. Carol was born on 9 Dec 1952. They had three children: Leanne Ellen, Catherine May and Stuart William. 7-Leanne Ellen Appleby was born on 4 Sep 1972. 7-Catherine May Appleby was born on 11 Mar 1975. 7-Stuart William Appleby was born on 21 Jul 1977. 6-Colleen Phyllis Appleby was born on 1 Aug 1948. Colleen married Dale Wallace Aitken. Dale was born on 27 Jul 1946 and died on 27 Feb 1984 at age 37. They had five children: Darlene, Gene, Gina, Leesa and Lisa. 7-Darlene Aitken was born on 20 Aug 1969. 7-Gene Aitken was born on 31 May 1971. 7-Gina Aitken was born on 31 May 1971. 7-Leesa Aitken was born on 10 Mar 1973. 7-Lisa Aitken was born on 10 Mar 1973. 6-Beverley Mavis Appleby was born on 2 Jul 1950. Beverley married Michael Rex Goodrick. Michael was born on 14 Dec 1948. They had two children: Jacqueline Andrea and Jayson Andrew. 7-Jacqueline Andrea Goodrick was born on 16 Aug 1971. 7-Jayson Andrew Goodrick was born on 22 Jul 1975. 6-Shirley Vonda Appleby was born on 30 Jul 1951. Shirley married Barry Francis Good, son of Keith Francis Good and Nancy Ada Carpenter. Barry was born on 20 Feb 1952. They had two children: Leigh and Renai. 5-Percy Stephen Coates was born on 10 Jul 1927. Percy married Eunice Betty Howe. Eunice was born on 10 Feb 1928. They had three children: Bruce Stephen, Anne Marie and Brian. 6-Bruce Stephen Coates was born on 9 Mar 1950. Bruce married Susan Harvey-Fuller. Susan was born on 20 May 1951. They had seven children: Matthew, Mathew, Emma, Thomas, Jacqueline, Alexander and David. 7-Matthew Coates was born on 4 May 1973. 7-Mathew Coates was born on 4 May 1973. 7-Emma Coates was born on 28 Oct 1975. 7-Thomas Coates was born on 24 May 1978. 7-Jacqueline Coates was born on 27 Sep 1979. 7-Alexander Coates was born on 9 Oct 1981. 7-David Coates was born on 7 Oct 1983. 6-Anne Marie Coates was born on 7 Mar 1954. Anne married someone. She had one daughter: Melissa Jane. 7-Melissa Jane Coates was born on 24 Jan 1974. 6-Brian Coates was born on 4 Jul 1954. Brian married Sandra Helen McCarthy. Sandra was born on 7 Dec 1959. They had three children: John, Jane and Robert Alan. 7-John Coates was born on 14 Oct 1979. 7-Jane Coates was born on 29 Jun 1981. 7-Robert Alan Coates was born on 16 Jul 1984. 5-Neil Coates was born on 30 Nov 1928 and died on 5 Mar 1988 at age 59. Neil married Joan Cox, daughter of Wesley Sydney Cox and Gladys Dora Lee. Joan was born on 6 Mar 1928. They had six children: Anthony, Sandra, Graham, Terry, Sally and Sharon. Neil next married someone. She had six children: Anthony, Sandra, Graham, Terry, Sally and Sharon. 5-Basil Arthur Coates was born on 14 Apr 1930. Basil married Doreen Webster. Doreen was born on 24 Dec 1932. They had four children: Michael Dennis, Judith Kathleen, Kevin Douglas and Valerie Margaret. 6-Michael Dennis Coates was born on 14 Jan 1960. Michael married Judith Anne Perrett. Judith was born on 22 Oct 1963. 6-Judith Kathleen Coates was born on 17 Feb 1962. 6-Kevin Douglas Coates was born on 22 Dec 1963. 6-Valerie Margaret Coates was born on 3 Nov 1967. 5-Aileen Mona Coates was born on 28 Dec 1931. Aileen married Walter Raymond Morse. Walter was born on 18 Apr 1924. They had eight children: Lorraine, Raymond John, David Robert, Garry Leslie, Glenn Arthur, Rodney Eric, Dianne Gaye and Linsey Andrew. 6-Lorraine Morse was born on 15 Jun 1954. Lorraine married Peter Stervein. Peter was born about 1952. 6-Raymond John Morse was born on 10 Jan 1956. Raymond married Christine Beach. Christine was born about 1958. They had one daughter: Kellie. 7-Kellie Morse was born on 1 Jul 1983. 6-David Robert Morse was born on 15 Feb 1958. David married Helen Schultze. Helen was born about 1960. They had two children: Lisa and Kylie. 7-Lisa Morse was born on 24 Apr 1981. 7-Kylie Morse was born on 29 Oct 1982. 6-Garry Leslie Morse was born on 7 Oct 1959. 6-Glenn Arthur Morse was born on 8 Sep 1960. Glenn married Jennifer Barwick. Jennifer was born about 1962. They had two children: Rebecca and Matthew Justin. 7-Rebecca Morse was born on 16 Oct 1982. 7-Matthew Justin Morse was born on 17 Jul 1984. 6-Rodney Eric Morse was born on 10 Oct 1962. 6-Dianne Gaye Morse was born on 7 May 1964. 6-Linsey Andrew Morse was born on 5 Sep 1971. 5-Leslie Coates was born on 29 Jan 1934. Leslie married Dorothy McKenna. Dorothy was born on 8 Mar 1935. They had three children: Denise, Julie and Jan.
6-Denise Coates was born on 26 Nov 1959 and died on 15 Feb 1968 at age 8. 6-Julie Coates was born on 26 Nov 1959. Julie married David Jacobson. David was born on 15 Oct 1958. 6-Jan Coates was born on 29 Dec 1960. Jan married Stephen Mansfield. Stephen was born on 23 May 1958. 5-Marion Jessie Coates was born on 18 Jan 1936. Marion married Maxwell Eric Johnston. Maxwell was born on 21 Jul 1931. They had seven children: Peter James, Ian Maxwell, Trevor Eric, Helen Faye, Kay Maree, Kevin Richard and Pauline Ruth. 6-Peter James Johnston was born on 3 Dec 1956. Peter married Carolyn Beth Clinch. Carolyn was born on 9 Apr 1962. 6-Ian Maxwell Johnston was born on 12 Jan 1958. Ian married Lynda Jane Cleaver. Lynda was born on 4 Sep 1961. They had two children: Emma Lynda and Benjamin. 7-Emma Lynda Johnston was born on 24 May 1982. 7-Benjamin Johnston was born on 24 Feb 1984. 6-Trevor Eric Johnston was born on 7 Oct 1959. Trevor married Debra Ann Monson. Debra was born on 7 Sep 1962. 6-Helen Faye Johnston was born on 2 Jul 1961. Helen married Geoffrey Robert Cooper. Geoffrey was born on 2 Aug 1960. They had one daughter: Linda Jane. 7-Linda Jane Cooper was born on 22 Jul 1984. 6-Kay Maree Johnston was born on 26 Jan 1964. Kay married Adye Viney. Adye was born on 27 Apr 1965. 6-Kevin Richard Johnston was born on 18 Jul 1970. 6-Pauline Ruth Johnston was born on 5 Jun 1973. Winifred next married John Benjamin Sushames, son of John Benjamin Sushames and Caroline Spinks, after 1940. John was born on 12 Oct 1888 in Ulverstone, Tasmania and died on 21 Jan 1958 at age 69. 4-Leslie Wilfred Smith was born on 17 Dec 1912 in Pine Road, near Penguin. Leslie married Thora Emily Stonehouse, daughter of Arthur Henry Stonehouse and Amy Alice Moore. Thora was born on 7 Jun 1917 in Mount Street, Burnie. They had four children: Dayle Arthur, Noel Alexander, Grant Leslie and Peter Bevan. 5-Dayle Arthur Smith was born on 10 Sep 1939. Dayle married Shirley Stone. Shirley was born on 24 Mar 1943. They had two children: Trudy Ann and Gavin John. 6-Trudy Ann Smith was born on 4 Aug 1964. 6-Gavin John Smith was born on 14 May 1966. 5-Noel Alexander Smith was born on 3 Jan 1942. Noel married Marion Sharman. Marion was born on 11 Mar 1945. They had three children: Julie Ann, Debbie Maree and Ricky Noel. 6-Julie Ann Smith was born on 5 Feb 1965. 6-Debbie Maree Smith was born on 4 Mar 1967. Debbie married Warren John Fielding, son of Barry Colin Fielding and Merlene Francis Best. Warren was born on 26 Sep 1962. 6-Ricky Noel Smith was born on 17 May 1971. 5-Grant Leslie Smith was born on 15 Sep 1946. Grant married Joan Rhoades. Joan was born on 13 Aug 1947. They had three children: Jacqueline, Jeremy Grant and Mark James. 6-Jacqueline Smith was born on 23 Sep 1971. 6-Jeremy Grant Smith was born on 17 Sep 1972. 6-Mark James Smith was born on 2 Oct 1977. 5-Peter Bevan Smith was born on 25 Jan 1951. Peter married Lyn Sherriff. Lyn was born on 2 Sep 1954. They had two children: Tracy and Leigh. 6-Tracy Smith was born on 12 Aug 1972. Another name for Tracy is Sartain. Tracy married Robert Douglas Sartain on 17 Apr 1993. Robert was born on 21 Mar 1956 in Coleraine, Victoria. They had three children: Samantha Lee, Zachary Douglas and Ashlee Jayne. 7-Samantha Lee Sartain was born on 24 Mar 1996 in Coleraine, Victoria. 7-Zachary Douglas Sartain was born on 28 Oct 1997. 7-Ashlee Jayne Sartain was born on 7 Jun 2001. 6-Leigh Smith was born on 15 Feb 1975. 4-Colin George Smith was born on 3 Feb 1919 in Pine Road, near Penguin and died on 24 Nov 1971 at age 52. Colin married Mollie Ashton Stubbs. Mollie was born on 11 Feb 1921. They had five children: Maureen June, Donald Bruce, Vicky Ashton, Leonie Jan and Lynette Faye. 5-Maureen June Smith was born on 15 Mar 1947. Maureen married Stanley Hester. Stanley was born on 9 Oct 1937. They had two children: Bevan Anthony and Darren John. 6-Bevan Anthony Hester was born on 3 Mar 1966. 6-Darren John Hester was born on 8 Aug 1967. 5-Donald Bruce Smith was born on 8 Jun 1948. Donald married Shirley Cameron. Shirley was born on 31 May 1947. They had two children: Joshua Colin and Melanie Jane. 6-Joshua Colin Smith was born on 16 Feb 1975. 6-Melanie Jane Smith was born on 17 Oct 1977. 5-Vicky Ashton Smith was born on 10 Sep 1950. Vicky married Graham Walker. Graham was born on 6 Oct 1943. They had three children: D'rene Kay, Tracey Marie and Scott Andrew. 6-D'rene Kay Walker was born on 19 Aug 1967. 6-Tracey Marie Walker was born on 31 Mar 1971. 6-Scott Andrew Walker was born on 3 Oct 1974. 5-Leonie Jan Smith was born on 12 Jun 1955. Leonie married Kevin Menzies. Kevin was born on 20 Jul 1952. They had three children: Karl James, Brett Kurt and Shelana Clare. 6-Karl James Menzies was born on 17 Jun 1977. 6-Brett Kurt Menzies was born on 31 Jul 1979. 6-Shelana Clare Menzies was born on 31 Jul 1979. 5-Lynette Faye Smith was born on 13 Sep 1957. Lynette married Colin Wearne. Colin was born on 11 Nov 1959. They had two children: Erin Lea and Shona Kate. 6-Erin Lea Wearne was born on 19 Jun 1985. 6-Shona Kate Wearne was born on 6 Oct 1987. 4-Mona Smith was born on 21 Aug 1921 in Pine Road, near Penguin and died on 20 Sep 1944 at age 23. Mona married Eric Terry. Eric was born on 5 Jun 1910.